Although there are lots of brush brands out there that create brilliant brushes that look great, not many of them are cruelty-free too. That is, of course, apart from Spectrum Collections. A fairly new brand that has been making waves ever since it launched, Spectrum Collections is all about creating truly stunning-looking brushes that are cruelty-free and work amazingly well. Available in a range of eclectic collections, including the mermaid-esque Siren range and the just-launched Marble range, these brushes are guaranteed to make a statement on your dressing table. 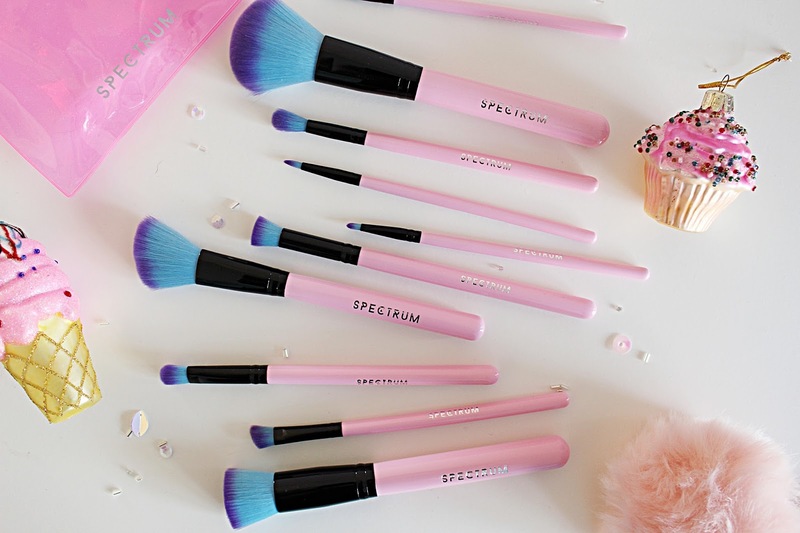 I was lucky enough to get my hands on the 10-Piece Essential Set in the gorgeous pink and blue 'Attention Seeker' range, which just screams unicorns and all things girly to me. The set comes with everything you need to get started with brushes - those for your face, eyes and lips, and at £39.99 that is around just £4 per brush - a total bargain. I love the look and feel of the brushes, and as someone who only uses brushes with synthetic hair I was so excited that these brushes, which look so amazing, are cruelty-free too. I've been using the set every day for a few months now and I cannot get enough. These are most definitely the best looking brushes I've ever used, but they are also some of the best I've used overall. The super soft bristles make applying my makeup an absolute dream, and I always find myself reaching for these over my other brushes. They look great, feel great and achieve great results for a really reasonable price - so what's not to love? I definitely recommend these brushes and I just love everything about the Spectrum brand - their quirky and colourful collections are right up my street, their branding and hilarious brush names are just brilliant and I've definitely got my eye on more of their fantastic brush sets and accessories - they do gorgeous brush rolls and makeup bags too!